1992: Played in five games, posting 30 total tackles, including 28 solo stops...Broke up eight passes...Intercepted two passes for 16 yards in returns. 1993: Led the Storm with six interceptions, then a franchise record...Also set a then-record with 113 yards of interception returns...Posted 53 regular season tackles and 11 postseason tackles. 1995: Named Second-Team All-Arena Football League...Posted 52 total tackles, including nine against Connecticut (7/21)...Returned a fumble 15 yards for a score at Miami (5/13)...In the playoffs, he made 16 tackles and intercepted two passes. 1998: Returned to the site of his previous career success when he was signed by the Storm before their Week Fourteen game with Grand Rapids (8/1)... Considering it was his first Arena Football game in nearly three years, he had an outstanding night, notchinh five total tackles, including two unassisted...Also broke up two passes...Finished fourth on the team in unassisted tackles in the postseason with six...Made three solo stops and two assists in ArenaBowl XII (8/23) ...Broke up a pass against New Jersey (8/14)...Signed by the Cleveland Browns in December. 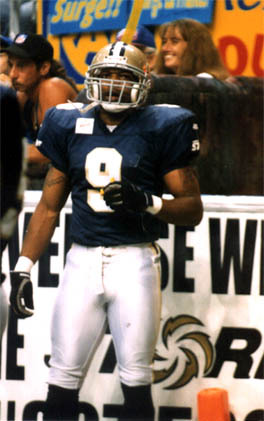 Other Pro Experience: Played for the Ottawa Rough Riders of the CFL in 1994, starting every game...Also spent time in the training camps of the New Orleans Saints and the San Francisco 49ers...Signed by the expansion Cleveland Browns on the first day they could sign players in December 1998. College: Graduated from Tulane University with a degree in sports administration in 1991...Started three years at Tulane (1988-90). Personal: Was an All-American at John McDonough High School in New Orleans...Is a native of the Crescent City...Full name is Corey Gerard Dowden...Three-time All-District and two-time All-Metro New Orleans...Has a son, Corey Dowden, Jr. Copyright © 1996 - 1999 by Gale Force Design. All rights reserved.